Looking for a tasty treat to make for or with your kiddos on that special day of love? Here are five treats that will make the day memorable! 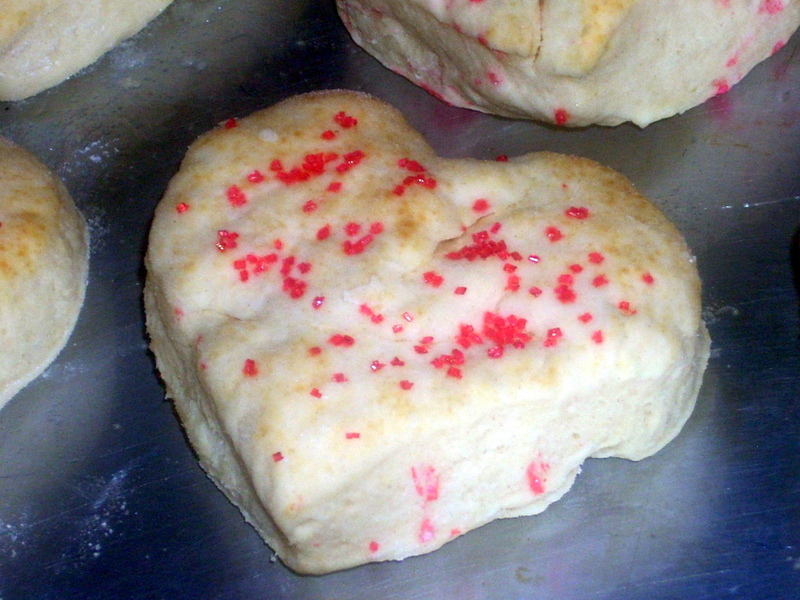 Take your favorite biscuit recipe (try this one), favorite quick mix, or pop-tube of dough, cut them with a heart-shaped cutter and press red sugar sprinkles in before baking! As Fancy Nancy would say, “Magnifique”! Check out this blogger’s instructions for Valentine dipped pretzels! I never realized before that a covered pretzel looks like a heart! So darling and tasty! You can do this activity with your kids and make some treats to deliver to their special friends, Grammy and Papa, or a secret Valentine! Here’s a fun snack mix recipe to try out for a hearty snack. If you have kids who will eat cashews, good for you. If they (like mine) constantly nix the nuts, or if you’re worried about allergies, just omit or substitute with granola or a boxed cereal like Cheerios, Chex, or Life. Trail mixes are fun to make with the little ones because it’s just pour and stir. Up the learning opportunity by pointing out the recipe and matching the labels to the ingredients. You might even have the kiddos make their own batches in little baggies by setting out the ingredients in bowls along with a measuring spoon or scoop with each one. On an index card next to each ingredient, write the ingredient name and a number, indicating the number of scoops to add to their baggies. Fantastic pre-reading, numeral recognition, counting, and procedural practice! Add strawberries to this Orange Smoothie for a pink drink! Slice the remaining strawberries along the length of the berry to create strawberry hearts for a garnish! Have a tasty Valentine’s Day! Click here for the developmental benefits of cooking with kids! Heart Branch image by rknds. Rainbow Pancake image by Amanda. All other vastly inferior images by me. Such fun ideas. We generally make a big deal out of the holidays. After cupid visits, we’re going to have to try a few of these. Great ideas in there!! Hope the boys love their heart pancakes!! Love these ideas and thank you! I can’t wait to try the heart shaped biscuits! Going to make those for my mom’s group and also take pictures of my son helping to make them for my Messy Kids blog.